And I asked him, of course, what he thought about Barack Obama’s speech. He grinned at me like he knew I had already guessed what he was going to say. “What did you expect?” he asked. Correct guess. After all, Haaretz had already referred this week to “President Barack Netanyahu” while the racist Israeli foreign minister said he would sign the speech with both hands. Maybe, I reflected in Jerusalem yesterday, Obama really is seeking election – to the Israeli Knesset. But what was so striking about the streets of Jerusalem yesterday was the sense of resignation, of weary acceptance. The Israeli papers had warned of mass violence, but the crowds who turned up for morning prayers at Al-Aqsa simply laid out their prayer rugs on the highway outside the Damascus Gate or in the laneways behind the mosque and showed scarcely any interest in talking about Obama. Maybe America’s UN veto will rouse them to passion, but I have my doubts. It’s a bit like the aftermath of the Abu Ghraib torture pictures, when the Americans restricted the number of photos to be released because they feared the pictures would enrage Iraqis. But I was in Baghdad that day and no one expressed any particular rage. What did I expect? After all, the Iraqis knew all about Abu Ghraib already – they were the ones who had been tortured there. So, too, Jerusalem yesterday. The Palestinians have watched America’s uncritical acceptance of Israeli occupation – the longest in the world – for 44 years. They knew all about it. It is only we Westerners who are horrified by torture pictures and by Obama’s hypocrisy. The Palestinians even accepted the Israeli rule on morning prayers. 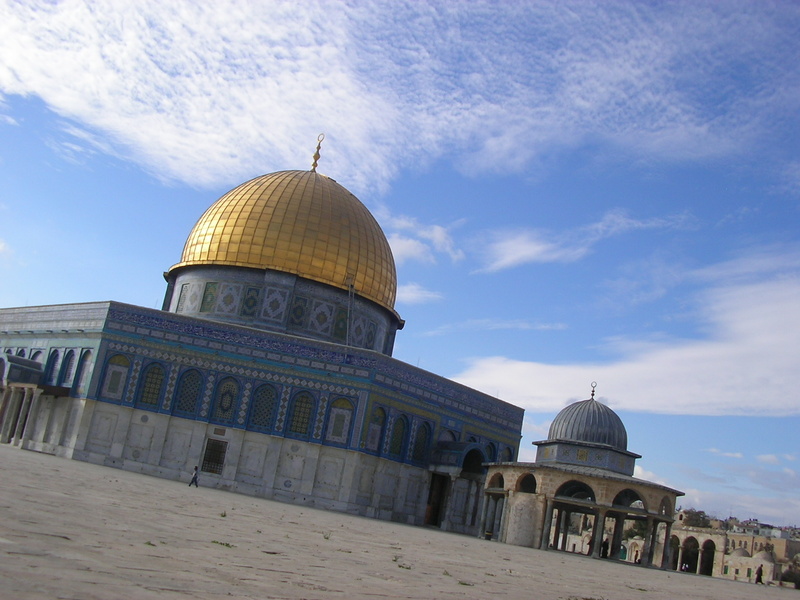 No one under the age of 50 would be allowed to worship on the Al-Aqsa esplanade. Which is why those who could not enter simply spread their rugs on the tarmac and flagstones outside – in effect enlarging the forbidden holy esplanade over the traffic islands and pavements. Even the Israeli border guards and cops treated the thing as routine. There was, shall we say, a normality about it, a bit of shouting from a young man at the barricade on the main highway, a lot of shrugging by the Israelis. There were even some nicely groomed police horses which watched the proceedings with big, tired eyes. On the iron barrier, the police captain didn’t even bother to ask for my press pass; he just flicked his head and pulled the barrier aside. The television crews dutifully filmed the Israelis holding their assault rifles and truncheons. And – since I am a believer in the Department of Home Truths – I have to add that in other Middle East nations right now, I doubt if armed policemen would be quite so indifferent to the cameras. Needless to say, the more aggressive of Israel’s colonisers in the West Bank are not so keen to be filmed. Hence the scarves over their faces when they attack Palestinians. And daubing “Mohamed is a pig” in Hebrew on the wall of the mosque at Qusra, 30 miles from Nablus, wasn’t going to improve Arab-Israeli relations. The Palestinians have painted out “is a pig”, but naturally left the name of the Prophet untouched. You can see the same stuff on the walls of the Jewish colony at Hebron. But again, it’s acquired its own normality, like the massive Israeli wall that scrapes across the landscape above Jerusalem, a terrible, hateful scar on the politics of this place which should blight the eye of every Palestinian or Israeli who sees it. Oddly, we Westerners seem to have stopped talking about it; maybe that’s why we like calling it a “security barrier” rather than a wall, something that is a problem to be solved – to quote Obama – “by the parties themselves.” And there was one little incident yesterday which illustrated this rather well. Prayers had ended at the Al-Aqsa mosque and the police were ready to go home and the shopkeepers were reopening their stalls when an old Palestinian woman in black came hobbling down some steps with two large, empty cardboard boxes. They were the “legs” to a table upon which she started arranging a set of tawdry children’s clothes and plastic shoes decorated with stars. But a soldier told her to move the boxes three feet further down the street. There was no reason to – he was bored, I suppose, and in the mood for a bit of fun – but the old lady started shouting in Arabic that “It’s all over”. I think she meant that it was “all over” for the Palestinians – or maybe for the Israelis. But the soldier laughed and repeated her words in Arabic. “Yes, it’s all over,” he said, and maybe he was talking about the morning prayers. And as he went on taunting the old woman and kicking the cardboard boxes, a trail of tourists came winding their way up the laneway from the Via Dolorosa. The woman was shrieking away and the tourists, light-coloured hair, blue eyes, speaking German, were all too aware of what was happening. Their eyes flicked to the side of the road where the woman was shouting and the soldier was still kicking the boxes, but their heads didn’t move. They still faced forward, as if the whole wretched scene was a normal part of Jerusalem life. They wouldn’t directly look at the woman or the soldier. They certainly wouldn’t intervene. And so they passed by on the other side.